The Constitutions that Shaped Us re-examines from a comparative and critical standpoint the events, key players, and texts which, taken together, help to interpret all Canadian constitutions prior to Confederation. The key constitutional documents that are studied in this book are the Royal Proclamation of 1763, the Quebec Act of 1774, the Constitutional Act of 1791, and the 1840 Act of Union. Great Canadian historians of the past take turns in providing unforgettable sketches and understandings of the actions of monumental figures such as Governors Murray, Carleton, and Elgin, British politicians from Pitt to Burke, Grey, and Durham, without forgetting the leading political and intellectual colonial figures such as Bedard, Papineau, La Fontaine, Mackenzie, and Baldwin. Gathering together the most renowned and representative works of constitutional scholarship, this anthology provides readers with an in-depth account of the events that would ultimately lead to the union of British colonies, the birth of the Dominion of Canada, and the rebirth of political autonomy in a colony known successively as Quebec, Lower Canada, Canada East, and once again Quebec in 1867. 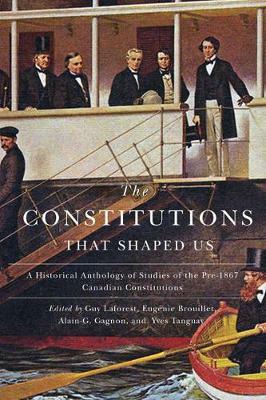 Following a general survey of the various constitutions enacted under British rule, this collection includes an equal number of commentaries by French- and English-speaking historians concerning each of the four constitutions to offer the most nuanced view of Canada's origins to date.